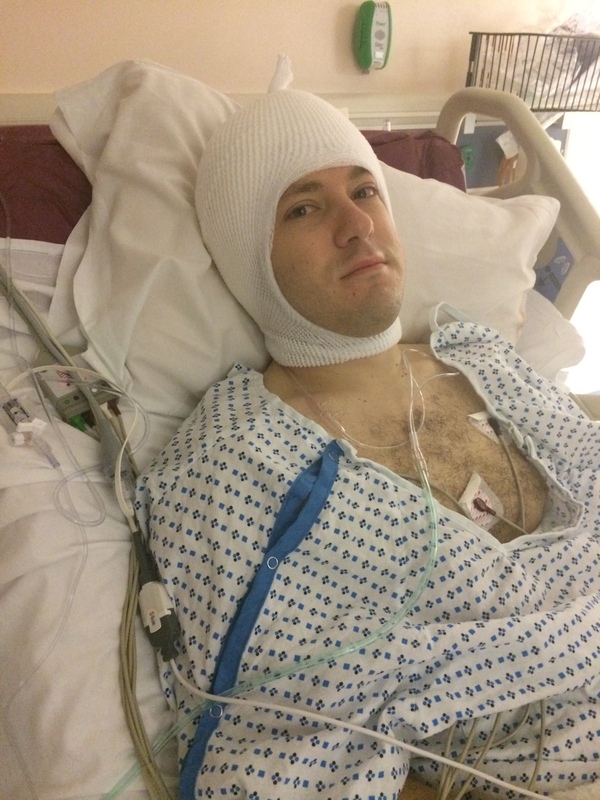 I turned over and looked over at the alarm clock – it was 4:59 a.m. My faulty brain knew that, in one minute’s time, the alarm would sound signaling it was time to be operated on. When I arrived at the hospital, I was ushered to the triage where I was given my identification bracelet, gown, hair cap and socks – lucky me. As the neuro-residents came over to check in on me, I waited in anticipation for them to roll me down the long corridor and into the operating room. I waited, answered another slew of questions about my health history and waited some more. Finally, in walked my surgeon. He came over to reassure my family and I of his confidences and to answer any last-minute questions, but also to “mark” me. “The tumor” he said “is in my left frontal lobe.” He then marked my left ear with an X. Umm, why did he just mark my ear with a Sharpie? So in typical Chris fashion, I said “Doc, I think I need my ear, don’t I?” Everyone got a good, much-needed laugh. Of course though, because I am Chris Cusano, nothing in my life comes easily or without issue. Just as I was about to head into the OR, one of the techs came out and apologized as he informed me that the operating table was broken and they were just waiting for the part to fix it. Again, I just smiled and laughed because at this point, what more can I do? Finally, word came that the table was fixed and it was time for this monster to come out for once and for all. I took a minute to say “see you later” and “I love you” to Ashley, my mom and dad and saw the resolve in each of their eyes. I know they were hurting and scared on the inside, but they showed me true strength and determination as we parted ways. As I drifted into a deep sleep, I did so with happy thoughts in mind. I was happily woken up to my name being called and seeing smiling faces looking at me. 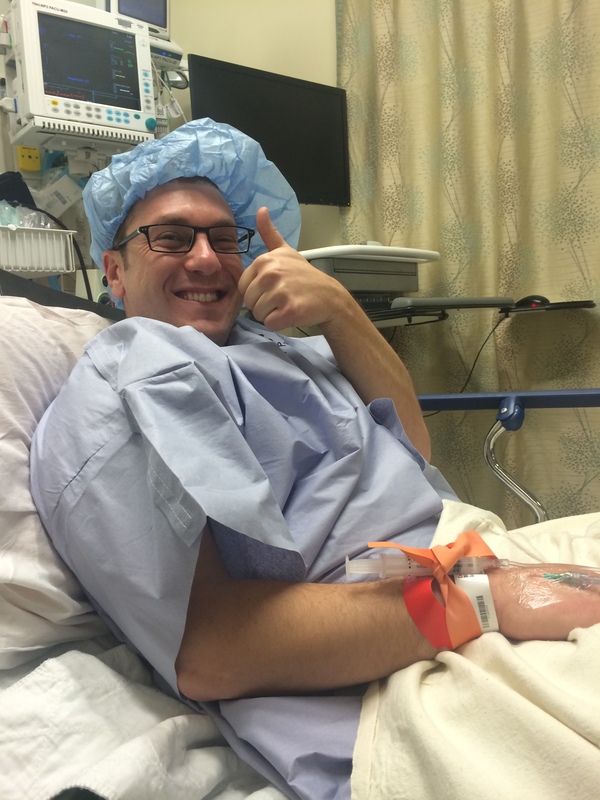 At the foot of my bed, there stood my surgeon giving me a thumbs up! “We got it Chris, you did great!” Unfortunately, the anesthesia had made me sick and I did not hear anything else that he had to say at the time. But I felt great otherwise, all things considered. By the time my family came in, I was alert and oriented. Ashley and I had joked prior to the surgery that we both wondered what the tumor looked and felt like. I had suggested to her that she ask my surgeon if she can see it and touch it. Not a second after I saw her, I asked “so, was it soft and squishy?” She instantly got it, laughed and told me I was still there. My parents and the nurse were not so quick to follow. Adults! I have said it all along – a sense of humor and a positive outlook goes a long way. Despite the fact that Ashley and my parents teased that I looked like a conehead, a smurf and a q-tip, I was in good spirits and knew the prayers had worked. As I laid in the bed, I looked ahead. I was eager to move – eager to get out of bed, walk, test my motor skills and resume my life. To show the world and myself that I had not missed a beat. I knew I hadn’t. Today, fourteen days removed from surgery, I find myself thinking about the ladybug again. After hearing that this operation was needed, my family and I felt as though she did not leave a sign, but was just there for comfort. Yet, in the days that have passed, I believe that she appeared again to let my family and I know that all would be alright. There are signs all around us. Sometimes, we don’t even need to search for them. As I parted ways with my parents and Ashley, who were escorted to the waiting room, and I was wheeled into the operating room, only one thought came to mind – I will persevere and see you all soon. But, I was not without emotion. The operating room is cold and sterile. The bright lights are reminiscent of a movie scene and the scalpels and doctors’ tools set the scene for a gruesome horror flick. But then, somehow, there was a feeling of peace and serenity. As I laid down on the operating table, the nurses and technicians propped my body and moved my limbs where they wanted them. I heard my surgeon’s voice in the background and then everyone in the room came over to the operating table to run through everyone’s duties for the operation. And then, with that, the IVs were started and into a deep sleep I went. First and foremost, my surgeon, Dr. Piepmeier. I do not have enough time or space to thank you for all that you have done and continue to do for my family and I, but let me say everything is noticed. The confidence that you carry and the assurances that you provide me have given me such great trust, belief and confidence in you. Your calming demeanor and persona are what get me through the day when I see you. As I have said before, ever since I was introduced to you on July 1, 2008, I was confident and knew that I would win this battle because you are my surgeon. Thank you for everything. To my nurses at Yale-New Haven Hospital: Tina, Max, Caroline, Maebel and Shanea. I want to thank each of you for your help and support in nursing me back to health. And Barb, for getting me out of bed and walking me around the hallways, I thank you. To the CT Brain Tumor Alliance, thank you for your support, messages and keeping me in your thoughts and prayers. Connecting with you has been one of the greatest things to happen to me in a long time and am so relieved to know that I have an army of support behind me. KC, you have welcomed Ashley and I into your family and I am so fortunate that this connection was made. To Aunt Linda for the never-ending love and support you have shown me. From the text messages, to the cards and the prayers, I cannot thank you enough. Your outlook on life and situations is inspiring and I cannot help but to think where I would be without you. Thank you for believing in me. And to my extended family and friends who took the time to send me a message of encouragement, support, to let me know your thoughts are with me or just to say hi, thank you. The love that I feel from you all is incredible and I am grateful beyond words. To Jackie, Stephen, Wayne and Greyson – you guys are the best. I don’t know where I’d be without you, but know that I’m still here because of you. You all keep the fight in me and give me the resolve to carry on and plow forward. Thank you for all that you do and know that I am forever grateful. Mom and Dad – I am so happy that you are my parents! From being with me every step of the way to nursing me back to health and checking on me all day, I appreciate it more than you may ever know. You have watched me grow into an adult and have seen my best and worst days but never wavered and never pushed me toward anything. I love you both very much and can only hope that none of us will ever have to go through such a tumultuous situation again. Finally, to Ashley, my loving, caring wife. You are amazing and I owe you so much more than I can ever repay you for what you’ve given me the past six years. When you heard that an operation was necessary, I shared your disappointment and nervous reaction, but you never outwardly showed that to me. Instead, you stood beside me with your head held high and were prepared to take down this monster with me and for that, I am so grateful. I love spending every day with you and am hopeful that now, with this behind me, we will have many many more days to celebrate life and enjoy each other every single day.